It's not clear at this point if this new hack is also performed by Syrian Electronic Army or not, but it is possible that the hackers have gained access to the other various developer-facing functions. Viber later responded after a previous attack that one of its employee's fell victim to a phishing attach and attackers could gain access to a customer support panel and support administration system, insisting that no sensitive user data was exposed. Last week, SEA was able to access the Popular messaging app Tango's website and also a World's biggest phone Directory - 'Truecaller' server, because they were using an outdated version of WordPress. Viber's helpdesk (support.viber.com) is using Kayako's customer service software, used by more than 30,000 organizations, which was defaced last week by Syrian Electronic Army. We have an official statement from Kayako, "The security of our customers' helpdesks and data is our highest priority. 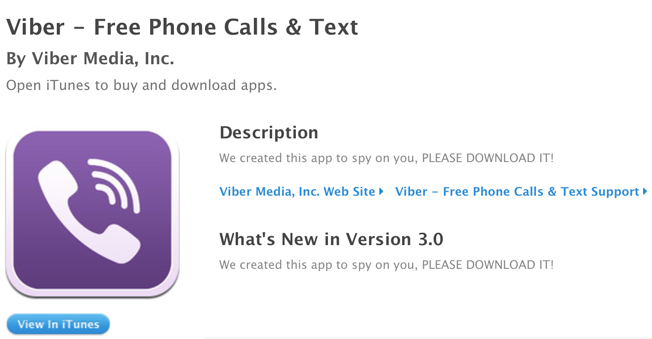 As Viber said in their statement, this looks to be an isolated compromise of an individual's account. Even so, we have taken the precautionary measure of auditing our systems. At this time we have no reason to believe that any other Kayako system or customer has been affected and we will continue to monitor the situation." Stay tuned to +The Hacker News for more updates about this story. Our AppStore has been brought within a very short time to its original state. To all of our users - there is no need to worry, no security damage was caused here. The change was only superficial, in the description of our app, nothing more. Of course, we are working hard to ensure that this will not happen again. Update : We contact Syrian Electronic Army team and they claimed the responsibility to hack Viber's Apple App Store account "They said that's everything is "safe", we proved by this attack that we reached too many systems and login details...".